Forging (hada) : Basic hada ware is precise Itame and perceive Masame indication overall. Tang (nakago) : UBU original. Two peg holes. Upper filemark is Horizontal Kiri and lower is greatly slanting left Ō-sujikai. 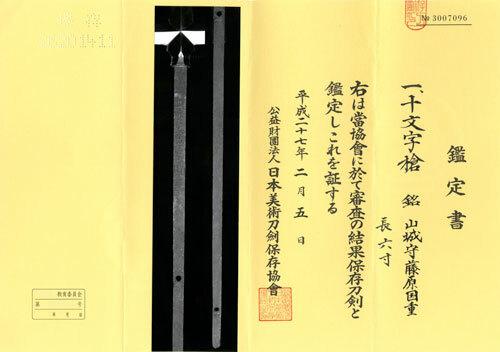 The signature starts with the official district Yamashiro-no-kami 山城守, name of clan Fujiwara 藤原 and smith name KUNISHIGE 国重. Smith KUNISHIGE 国重 who enjoyed Yamashiro-no-kami 山城守 title granted by the Imperial Court was active Meiwa (1764-71) era in the middle of Edo period. He was a pupil of Musashi-taro YASUKUNI 武蔵太郎安国、lived in Azabu town, Bushu Edo. after the entry of Buddhist monk in his later age, he named himself "I'kko" 一虎 . 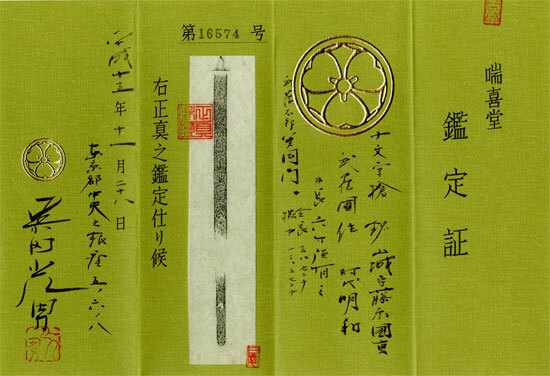 A large number of extant works by Yamashiro-no-kami KUNISHIGE is an artistic Yari spear like this example. Making such imposing presence of Yari requires a lot of skill, surely he was a great master at making Jyu-monji shape Yari in prosperous Bushu-Edo (today Tokyo) with great popularity from high class Samurais.